Andel Compact crankarms only with spindle installed. Integrated spindle and outboard bearing style. Bottom Bracket and Chainrings NOT included. Requires a Shimano style 24mm external bearing bottom bracket. 110bcd. Bottom brackets are available to fit most modern bike brands including Trek, Cannondale, BB30, PF30, and more. Click here to see bottom bracket options. 1. Q-factor 168mm (double chainring). 2. 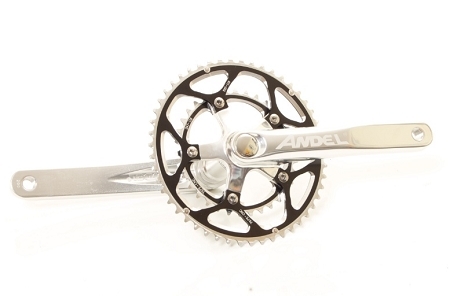 Chain-line 43.5mm (double chainring).